Melissa's Mochas, Mysteries and Meows: It's Time to Nominate Your Favorite Pet Blogs! Mudpie: Mommy, did you read the email we got about nominations being open for the this year's Nose-to-Nose Pet Blogging and Social Media Awards? Mommy: I did, sweetie. It's a wonderful way to show our favorite pet bloggers how much we appreciate their hard work. Mudpie: Remember how exciting it was last year when we were a Finalist for Best Written Blog Post? Mommy: I do. That honor was all about Truffles. She deserved it too. Mudpie: Mommy, do you think our readers would think it tacky if we asked them to consider nominating us again? I loved the blog post you wrote this year about your memories of that last day with Truffles, and how I'm working really hard to heal your broken heart. Mommy: I think it would be okay if we remind them that nominations are open, not just for our sake but so they can nominate all their favorite pet blogs. There's so much talent in our little community. Mudpie: Don't forget to ask them to nominate me in the Most Beautiful Blogging Cat category. Mommy: That's not one of the categories, sweetie. 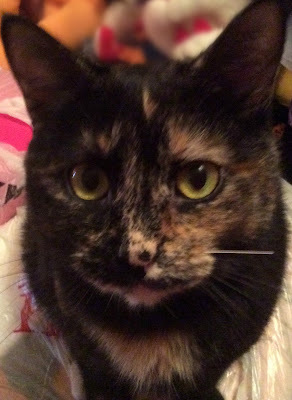 Mudpie: How about the Cutest Tortie category? Mommy: That's not one of the categories either. Mudpie: The nomination for gorgeous kitty most likely to replace that highfalutin Fancy Feast Persian? Mudpie: You've gotta be kitten me???!!! Well I'm emailing BlogPaws to demand that they be added!!! These nominations are super special because they come from our friends who know us best. Words can't sufficiently express how much it means to us that you take time out of your busy schedules to stop by and see what we're up to each day. We wouldn't be doing this if not for each and every one of you!!! Now if you'll excuse us, we have a bunch of blogs to nominate ourselves! I bet you will get lots of nominations! I'm wif Summer - I bet you'll get a ton of nominations! Thank you for sharing this, Mudpie and Melissa, because we didn't even know nominations were open yet. And we will certainly be nominating you! You deserve it! Olive is with you, Mudpie. She can't believe there's no Cutest Tortie category!!! I'm sure nominations will be rolling in for you guys! Excuse us while we get to nominating!!! Oh, you are awesome. We hope you win! Hugs. We wish you the best luck in the competition!